Located at 16 Park Place near Broadway, TriBeCa is SPEAR’s second location south of 14th street. 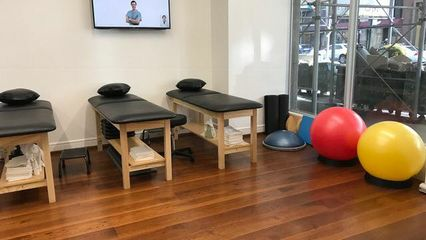 Its central address, adjacent to the City Hall and Brooklyn Bridge subway stations in the historic Woolworth building, makes it one of the most accessible clinics in the city. Lauren is the Clinical Director of SPEAR’s Tribeca location and a Certified Hand Therapist. Lauren moved to NYC in 2010, where she attended and graduated from Columbia University with a Doctorate in Physical Therapy. At Columbia, Lauren was the APTA representative for Columbia’s PT program, attending student conclaves and actively participating in APTA events. Prior to graduate school, Lauren received her Bachelor of Science in Kinesiology from The University of Western Ontario, a small town outside of Toronto, her hometown. Lauren has most of her clinical experience in outpatient orthopaedics. With recent Hand Therapy exposure, Lauren hopes to become a Certified Hand Therapist. Along with hand experience, she loves to work with a variety of different patients, body parts,and injuries and is currently studying for her Certification in Orthopaedic Manual Therapy. Since joining the SPEAR team, she has also become more involved with Pelvic Floor and Chronic Pain patients, and has started teaching the Pelvicore class. After making the move to NYC, Lauren fell in love with the people and the city. She loves spending her free time visiting her family in Toronto, and housing all of her Canadian visitors. She was not active in sports throughout college, but did find her calling later in life when she started practicing Muay Thai, which she did until her move to NYC. Lauren likes to stay active, trying out new running routes around the city and taking salsa lessons in her neighborhood, as well as spending time enjoying what the city has to offer with her family and friends. Kathleen is a registered occupational therapist with a Masters of Occupational Therapy from Quinnipiac University in Hamden, Connecticut. Kathleen completed her undergraduate at Quinnipiac University, graduating with a Bachelors Degree in Health Science. At Quinnipiac, Kathleen was a member of the school’s Kickline Dance Team for 4 years and for 2 years was the chair of the Social Committee within the team. While at Quinnipiac University, Kathleen was able to spend 6 months in Cork City, Ireland studying abroad as well as 1 month backpacking around Europe. Kathleen has experience with various diagnosis including stroke, traumatic brain injury, spinal cord injury, orthopedic surgeries and injuries, amputations and general debility. Kathleen has presented research at the 2016 ATOA conference on the subject of returning to work following a stroke. Kathleen loves being an occupational therapist because she loves to guide individuals towards independence. The relationship between therapist and patient is very important to Kathleen in order to create client-specific goals; she believes that this enhances the overall therapeutic benefit of OT. In her free time, Kathleen loves spending time with family and friends, dancing, traveling and doing DIY projects. Kate earned her Doctor of Physical Therapy degree from Rutgers University. She received her Bachelor’s in Health and Exercise Science with a minor in Psychology from Wake Forest University. Her professional interests include outpatient orthopedics, sports medicine, and pediatrics. Kate’s interest in pursuing physical therapy came from a desire to help patients reach their full potential and return to the activities that are most important to them. She strives to provide patient-centered care by developing individualized physical therapy plans using a combination of manual techniques and therapeutic exercise. Growing up, Kate played soccer and softball competitively and continues to stay active through regular exercise. In her free time, Kate enjoys acting as a mentor for a local high school student and exploring her new home in New York City. Andrea Bettini was born and raised in Caracas, Venezuela. While in high school, she practiced sports including tennis, volleyball, soccer, skiing, and swimming. At the age of 15, her father suffered an ACL tear while skiing and while she watched him go through the rehabilitation process, Andrea discovered a strong interest in physical therapy. Andrea moved to the USA when she was 18 years old and attended Texas A&M University-Commerce, earning a B.S. in Biology with a minor in Exercise Physiology. During this time, she worked as a laboratory instructor for the Biomechanics and Kinesiology courses and was exposed to VO2 maximal testing protocols, nutrition, and strength and conditioning. After graduation, Andrea moved to New York City to attend Physical Therapy school at Long Island University- Brooklyn. She obtained her Doctorate in Physical Therapy degree in May 2017. While in school, Andrea was exposed to outpatient orthopedics, vestibular rehabilitation, inpatient rehab and intensive care unit rehabilitation. She has also volunteered in the New York and Houston Marathons to help athletes recovered after finishing the race. Andrea’s clinical interests include orthopedics, sports rehabilitation and injury prevention, especially in young athletes. In the future, Andrea wants to create a program for injury prevention in teenage athletes. Her goal as a physical therapist is to provide patient-centered care to all individuals and help her patients return to playing sports and normal daily activities as quickly as possible. In her free time, Andrea enjoys staying physically active through CrossFit and walking around NYC. She also loves traveling, dining (especially ice cream), going to the beach, and spending time with friends and family. Caley Brown received her Doctorate in Physical Therapy from New York University and her Bachelor’s degree in Health Policy and Management with a concentration in Business Studies at Providence College. Caley’s clinical experience includes orthopedics, sports rehabilitation, neurological acute care rehabilitation, and intensive care unit rehabilitation. Caley has a passion for orthopedic and sports rehabilitation and focuses on neuromuscular reeducation to help restore functional movements patterns and help prevent further injury. She is a Certified Strength and Conditioning Specialist and a member of the National Strength and Conditioning Association. Caley also works at Lenox Hill Hospital on the neurosurgical unit where she has experiences with a variety of diagnosis including stroke, brain surgeries, orthopedic surgeries, Gillian barre syndrome, vestibular issues, and amputations. She approaches each case differently so as to provide patients with an individualized treatment plan to assist them in getting back to their prior level of function. In high school Caley was a three-season athlete participating in track and field, field hockey, and horseback riding. Caley was a member of Providence College’s Track and Field team as a high jumper and spent a good deal of time in the sports medicine clinic, which is how she discovered her love of physical therapy. Caley enjoys staying active with running, spinning, and kick boxing. During her free time, she enjoys exploring the city, watching hockey and football, and spending time with family and friends.